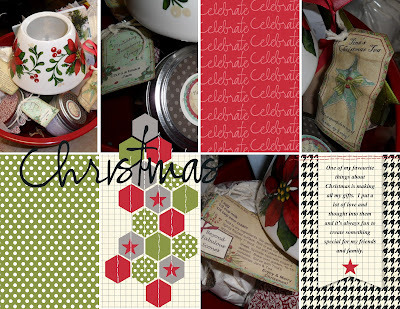 The Serene Stamper: Inspiration from Christmas Past! Hi Friends! I thought that it might be fun today to revisit "Christmas Past" with some of the holiday projects I've made in the past few years! Some of the products I used on the cards and projects will have retired but I'm sure you will be able to find something in your craft stash to improvise, or you can click HERE to shop online to substitute with our current products. Just click on the project title and you'll be directed to the blog post with the list of supplies and details. To see the video to make the Snowman Tealight Ornament boxes click HERE. Everything you create in the kitchen can be dressed up with some pretty Christmas paper, ribbon and embellishments! And if you need some tried and true recipes, click HERE for some of my favourites. Scroll down the page for the Fireside Coffee recipe too - it's always a BIG hit! Make sure Santa knows what you want for Christmas this year! 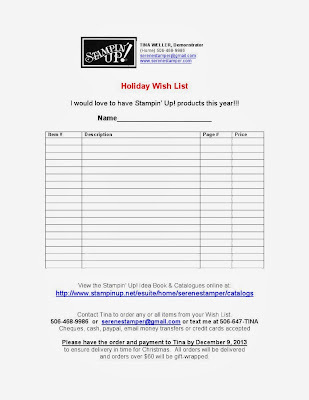 Simply print out your wish list, fill it out, and get it to me by Monday, December 9th at the latest. Have Santa call me to tell me how good you've been this year and how much to order for you. I'll pick items from your wish list to fit within Santa's budget and have it wrapped and ready to go under the Christmas tree. But hurry! Orders must be submitted by the Dec 9th to ensure arrival in time for Christmas. Here are some quick links for you to see our current promotions, new stamp sets and more! Come back tomorrow for "Passport Pals"! Frenchie will be here again with another fun post and I'll be sharing my inspiration on her blog.